While it is debatable whether the United States should intervene in criminal cases in China, such as that of the recently executed street vendor Xia Junfeng, it is unacceptable for Washington to ignore China’s human rights record when it can raise the issue without being accused of “interfering in internal affairs.” Washington will have such an opportunity when the U.N. General Assembly chooses new members of its Human Rights Council this month. China, after a year of leave, is seeking a three-year term on the council. It is critical for the United States to show Beijing’s new leaders that their horrific treatment of citizens matters. U.S. government agencies, Congress, U.N. human rights monitors and human rights organizations show the atrocious extent of Chinese repression. Putting China on the U.N. Human Rights Council would be like picking the fox to guard the henhouse — while it was still wiping feathers off its mouth. Yet the Obama administration appears to approve of doing so. For many reasons, China is unfit to sit on a council charged with protecting human rights: As the Congressional-Executive Commission noted in its 2012 annual report, forced abortions and sterilizations are still common in China. The State Department’s 2012 report on human rights said that the denial of religious freedom in China remains pervasive and was particularly severe against Tibetan Buddhists, Muslim Uighurs, Falun Gong practitioners and members of house churches. China tortures its citizens. This is a violation of the Convention Against Torture, to whichBeijing is a party. Beijing also returns refugees to North Korea, where they will be imprisoned and tortured. This is a violation of the Convention on the Status of Refugees, which China has signed. Dungeons across China hold tens of thousands of Tibetans, Uighurs, Mongols,Christians, Muslims, Falun Gong and Han Chinese who bravely seek to defend the human rights of those persecuted for their faith or ethnicity or for seeking the rule of law. China is the only country in the world that detains a Nobel Peace Prize laureate.Tibetans are driven to self-immolation by their continued oppression. 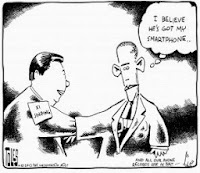 TheCongressional-Executive Commission on China annually details gross violations of human rights. China’s brutal actions belie its claim that economic modernization would lead to decreased human rights abuses. Such notions are disproved by headlines about the latest outrages, such as when human rights lawyers were beaten earlier this year while seeking to visit unlawfully jailed political prisoners. China’s “reforms” involve change in economic and governmental institutions or minor procedural improvements. They do not extend to meaningful human rights reform. Some believe that the United States cannot press China on human rights because it seeks Chinese cooperation on economic and national security issues. But Washington hasnegotiated arms-control and trade agreements with other countries, including the Soviet Union, while pressing for human rights reform. Other nations have risked economic ties to criticize Beijing, including Norway, which awarded the Nobel Peace Prize to Liu Xiaobo over China’s strong objection; Canada, which has sharply criticized Chinese treatment of Tibetans; and the European Union, which has condemned China’s human rights abuses. To be elected to the council, candidates must get 97 votes from General Assembly members. If each U.N. democracy votes no, China will not succeed. U.S. resolve would help other democracies summon the courage to confront China. The United States has opposed other candidates for the council that have terrible human rights records, including Syria and Iran. Beijing’s record of rights abuses is even worse. How could U.S. representatives at the United Nations vote to place the torture capital of the world on the international body charged with protecting human rights? The United States may not have been able to intervene in the case of Xia Junfeng. But opposing China’s candidacy for the U.N. Human Rights Council is the least Washington can do.